WannaCrypt does not infect XP machines – the problem appears entirely (or almost entirely) on unpatched Win7 machines. Kevin Beaumont reports that folks inside the UK NHS tell him their machines haven’t been patched since December. The people behind WannaCrypt have collected a total of about $30,000. People at Microsoft claim that “nobody running Windows 10 was infected.” I can’t confirm that. Clearly, those who have installed MS07-010 through Win10 cumulative updates are OK (see the list below). But if all Win10 machines are immune, I’d sure like to see an explanation. There are lots of explanations about the inner workings of the worm. This one from Malwarebytes is particularly thorough. But I haven’t yet seen a definitive description of how the payload first gets into a network. Many believe that the first point of infection is via a rigged email — but I haven’t yet seen a copy of a bad email. If you have definitive evidence, I’d sure like to hear about it in the comments. There are new variants, both with and without killswitches. I haven’t seen any widespread problems yet, but folks YOU HAVE TO GET PATCHED. Creating a new variant is easy. I’ll have a more detailed and up-to-date post on InfoWorld on Monday, but for now, here’s what you need to know if you’re concerned about the WannaCry/WannaCrypt worm and its enablers. We’re at MS-DEFCON 2, and that’s as it should be: you should not install any of this month’s patches. It’s still too early to tell if anything this month will cause problems — and there’s so much dust floating around it’s hard to see anything. But if you missed the March or April patches, if you’re running Windows XP, 8 or Server 2003, or you aren’t sure if you got March and April patches installed, here’s what you need to do. It clobbered lots of sites and many computers, but it’s no longer a threat. The folks at Malwaretech.com enabled a sinkhole that’s blocking WannaCrypt. No more infections. Rather than specifically rooting out WannaCrypt, you need to focus immediately on plugging the hole(s) that made WannaCrypt possible. The WannaCrypt code’s out in the wild, and a simple change would make it work again. More than that, other pieces of the Shadow Brokers trove can be used to make new, innovative malware. Get patched now. As of this writing, nobody has any idea who made WannaCrypt, why they released a weapons-grade exploit to beg for chump change ($300 per infection), and how the first infection(s) appeared. Microsoft released patches for Windows 10, 8.1 and 7 back in March (that’s MS17-010). Yesterday, they released patches for Windows XP, Win 8, and Server 2003 SP2. There’s an excellent overview by Elizabeth Dwoskin and Karla Adam published in the Washington Post on Saturday evening. Here’s how to see if you need patching, and how to get patched if need be. You don’t have the patch, unless you downloaded and installed it already. Follow the links under “Further Resources” at the bottom of the Technet page to download and run the installer. See if the patch is already installed. Click Start > Control Panel > System and Security. Under Windows Update click the View installed updates link. Look for one marked “Security Update for Windows Vista (KB4012598).” If you don’t have it, download it from the Microsoft Update Catalog, and install it. If you have any of those patches already installed, then you are good to go and you can sleep well at night. Don’t be confused. There’s no reason to download or install anything, unless you have absolutely none of those patches. No, I’m not recommending that you install something. Just look at the list and see if you have any of the patches. If you have none of those patches, download and install the March, 2017 Security Only Quality Update for Windows 7 (KB4012212) for 32-bit or 64-bit. If you have any of those patches, you’re fine. Again, I’m not suggesting that you install anything unless all of those patches are missing. If you have none of those patches, download and install the March, 2017 Security Only Quality Update for Windows 8.1 (KB4012213) for 32-bit or 64-bit. See note above about Security-only patches. Again, this list is complete, I believe, and accurate. Creators Update (version 1703) is OK. Anniversary Update (version 1607) – Check your build number. If you have Build 14393.953 or later, you’re fine. If you don’t, use Windows Update to install the latest build 14393.1198. Yes, I know that violates the current MS-DEFCON 2 setting, but you need to get up to or beyond 14393.953. Fall (er, November) Update (version 1511) – use the steps above to check your build number. You have to be at build 10586.839 or later. Abandon the MS-DEFCON rating system (and all hope — “Lasciate ogne speranza, voi ch’intrate”) if you must to get up to or beyond that build number. RTM (“version 1507”) – same procedure, make sure you’re up to or beyond build 10240.17319. And remember that your system’s toast soon. Everybody needs to get their systems updated, at least to the point mentioned here. Yes, that includes your sainted Aunt Martha. MrBrian 1 year, 10 months ago. 16 users thanked author for this post. Under Windows 7, you mention “If you have any of those patches, you’re fine.” Not true if you are in Group B since April and May Security Only updates are not cumulative. For Group B, the March Security Only update must be installed. I don’t have any Windows 8x computers, yet I assume that similar would apply to Windows 8x Group B users. Take a look at the list again. For Win7, if you have the March, April or May Monthly Rollups you’re fine. If you have the April Preview you’re fine. If you have the March Security-Only patch, you’re fine. Otherwise, you’re begging for trouble. The other Security-Only patches don’t enter into the equation. Yes, I now see this. Yet I had initially misread it. Others might misread the list as well. Perhaps you should explicitly mention that for Group B user who avoid all updates which install telemetry, those users must have the March Security Only update installed. Needless to say, and due to the NSA’s inept ability to prevent disclosures of their hacking tools, we most likely will see a storm of ransomware and malware which will infect unpatched Windows computers. I bet that both state actors and cyber-criminals are paying their people overtime and bonuses to develop malware and worms which use the NSA exploits which were revealed by ShadowBrokers. But that tool only blocks WannaCrypt – which has already been blocked, for everybody, forever, thanks to Malwaretech.com. WannaCrypt is no longer the problem. The problem is with MS17-010. People have to get that baby installed. Now. The “accidental hero” who halted the global spread of an unprecedented ransomware attack by registering a garbled domain name hidden in the malware has warned the attack could be rebooted. But that tool only blocks WannaCrypt – which has already been blocked, for everybody, forever, thanks to Malwaretech.com. WannaCrypt is no longer the problem. The problem is with MS17-010. People have to get that baby installed. Now. Not forever. The code can be very quickly modified to not look for this obscure domain name which has been sinkholed. Several people pointed out how quick and easily this could be done. This is why I think that Spain’s CERT tool remains relevant for the time being. I’m a bit confused. I’m in Group A, have Win 7×64. I installed March Security rollup which was replaced by cumulative April rollup KB4015549 which I have installed on my computer. Your list under Win 7 also notes May 2017 rollup (Group A) 4019264. Are we supposed to install that security monthly rollup now? Or does having IB4015549 protect for the time being? It’s too early to install the May Rollup yet. Wait till the DEFCON number goes to 3 or above. If you have the March and April Rollups installed, you are safe. I installed March rollup 4012215 but doesn’t it get replaced by the cumulative rollup in April 4015549? I can only find 4015549 now yet my list of installed updates in WU list shows March installed on 4/3/17 and April 4/25/17. I’m on Group A.
That’s as it should be. Everything’s fine. No need to install anything new. As long as you have any one of the listed patches, you don’t need to install anything. No. There’s no need to install any new patches unless you specifically don’t have ANY of the ones in the list. 100% correct. Woody has done an excellent job of updating his original post in order to make everything as clear as possible, to mention the specific Group B March patch which must be installed, and by adding information for the patches which are available for both Vista and XP. Everything is now quite clear if one takes the time to carefully read Woody’s revised post. Hello and thank you for the advice about patches. After a normal format over the weekend (Windows 8.1 home/Haswell), no matter what I try, I cannot install any windows updates. Already been preparing to go to Linux, but now that’s very urgent. Wondering if others are having the same problem. Microsoft’s even worse hard sell of Win10? @anonymous the web site below should speed you on the way for installing Win8.1 updates, although I really think the M$ update catalogue is going to be busy/slow and for a while yet this weekend/week. I can’t get the update on Windows 8.1, including using IE. Given up. Disable SMB1 (if after repeated attempts to update, you can’t), make good backups straightaway if you haven’t recently, use an external drive and get the important files, defrag, use something like Ccleaner to wipe empty space, (slow), and have nothing important on a Windows computer. Reached the stage where its getting ridiculous, for whatever reason. Have a live USB ready and make the switch. Couldn’t agree more, and, even when it does eventually come up, it then breaks the machine. Oddly, it did come up, after messing with everything under the sun for 3-4 days. But it installed 6+ telemetry updates, which I had to sort through 196 to find and remove, and it’s broken my tablet driver and net, the latter so badly that nothing but yet another format would fix it. You’re right about SMB1. Fully backed up onto externals, ccleaner is great, and the Mint USB is so ready. Looking into dual boot again briefly (proved difficult when tried before), but tbh have already bought a console to cover the games side, sorted art programs to use on Linux, only need to find out how to stream/itunes-similar, and so it’s good riddance to Windows asap. What a heap of junk. Nothing is worth this much stress, wasted time and intrusion. I’m a home-user, Windows 8.1, 64-bit, Haswell. I’ve had trouble getting windows update to find/install updates over last 2+ months, even before “processor” problems. Windows update never broke, as it did for the “affected” processors; but it can run 24-36 hours without finding updates. I have to stop WU, come back 1-2 days later and try; or run the windows update trouble shooter. Eventually, I get the monthly security only and IE (from this site), and .NET updates (thru WU) in. I thought I was the only W 8.1 person having WU difficulties. My W 7 pc installs everything just fine and quickly. Good luck with Linux. This forum is a tremendous help. Did you see Woody’s “Group B update problem” forum? Thank you very much for the link; will definitely read that, as am going to attempt dual boot briefly again before taking the inevitable full plunge. WinUpdate had suddenly come through, but broke tablet driver, and also broke the net too badly to fix except through re-formatting again. End of tether vanished miles back, lol, and had already been preparing to leave Windows behind; going entirely to Linux has just come round a lot sooner than I expected. Thanks for good wishes. Hope your updates come through okay, and great to meet you and others on this impressive forum. Should read KB4019264 and KB4015549 above. Your list is confusing. It reads as if people should be installing 2017-05, which is this month’s update. After reading comments here, I know not to, however I feel others may not investigate as they should. Yeah, I see what you’re saying. Wonder how I can word it better. Probably add more emphasis…. I see the changes you’ve made. But hey, that’s just my thought. Thanks for all your help, Woody. Woody, the Link for the Catalog Downloads from the Microsoft Technet Article shows also a Windows Vista Link, for this patch: KB4012598. So I guess there is a Vista patch after all for the specific vulnerabilities used to spread the ransomware. OMG. You’re right! Thank you! I forgot that Vista was still being patched in March. May I suggest that instead of scanning the list of updates, it is easier to copy each of the relevant KBs from your post and paste it into “Search Installed Updates” (at the top of the window on the right-hand side)? Follow the links at the bottom of the Technet page to download and run the installer. Follow the links under “Further Resources” at the bottom of the Technet page to download and run the installer. It’s my understanding that the normal propagation is as a worm – it looks for exposed SMB servers and passes the bad code that way. I don’t think there’s a zip involved, except possibly as an initial infection vector. It’s entering as an email attachment (social hacking), the runtime does not need admin rights on the workstation, and from there it scans for vulnerable SMB holes on workstations and servers that are not patched. We just finished doing a deep analysis across our clients. All of them were patched EXCEPT for several Windows Server 2003 Standard and Storage Edition servers . . . which got patched with the emergency patches that Microsoft released this weekend for them. I am happy to say none of our clients got infected, but we were definitely on high scramble mode for the last 48 hours! Now for some sleep . . .
And round two started sometime today, without the “kill switch” that taking over the domain it used triggered. I think what we saw was a “test” that got out of control. The real mess could start Monday morning as you said. Have you got a link for confirming v2.0 doesn’t have the kill switch? I’ve seen conflicting reports, some saying it was merely a theory on how the progression would happen – it left me confused, so I didn’t post anything about it until I found out more. Thks. New variants (at least two) without kill switches started to be seen on Saturday. I’m just catching up early Sunday morning my time… Has anybody found one of the infected emails? What you describe matches all of the observed problems – but as of last night, nobody had isolated the initial infection vector. I don’t believe even MS has confirmed the exact initial attack vector, we are only presuming that it’s email, but we’ve seen infections that started from machines where the end user did NOT have local admin permissions. Two new #wannacry variants found: One had modified killswitch. Second has killswitch disabled, but ransomware payload doesn’t execute. The link goes to the windows 7 page instead of 8.1. Yes, John in Mtl is right. I was also directed to Win7 KB # as well for the remedy of Win8.1. You and pigtail are both right. I’ve modified the download links (per PKCano’s suggestion) to get you directly to the download. Wait Windows XP and Windows 8 got a patch? Did I read it right? I thought those two weren’t supported anymore. Microsoft was kind enough to release these specific patches for XP and Win8, even though they were under no obligation to do so. They had already developed the patches, but prior to yesterday they were only available to customers who are paying big bucks to get extended support. So, Microsoft still has a heart! For whatever reason they had, to publish the patch to everyone, its still a good gesture on their part and it didn’t cost them anything. But I still won’t get and use windows 10. It has always been the case with widespread malware using an OS design flaw. I remember at least one similar instance in the past when there were updates released for those OS versions in custom extended support. I think in that case it was about Windows NT 4 if I remember well. Since XP is vulnerable, I’m kind of curious to know if 2000 and the 9x series are vulnerable too. Personally I think that this is Microsoft trying to cover their rear end, instead of having any heart whatsoever for everyone who refuses to upgrade to the Windows 10 Telemetry Operating System (WTOS). Microsoft was kind enough to release these specific patches for XP and Win8, even though they were under no obligation to do so. I think this is debatable. Imagine half of the 25% of the computers running XP and many more still running Server 2003 in businesses being actively sources of malware on the internet. Even so, I doubt that many of those running XP/2003 would do updating or be aware of the current update. So companies still pay for extended support even after extended support ends? I did not know that. Only those with money to waste instead of using the same money to replace their legacy software and operating systems. Most companies do not pay for custom extended support, as the cost involved is prohibitive for most of them. Yes it was a nice gesture from MS……. you know if some companies (not naming anyone) would realise/understand that by helping others they are helping themselves as well. Service/Customer relationship……… comes to mind. When a company adheres to this……… the sky’s the limit……. they and their customers flourish. And although MS’s gesture was very generous….. it was a responsiblity that they owed to the internet. I am quite surprised, but delighted, to see that Microsoft actually released the corresponding patches for Windows XP and Windows Server 2003. They may have their reasons for doing that (Perhaps there are still many Windows XP and Windows Server 2003 systems out there, eh? ), but I still applaud them for this gesture. I read Woody’s article. For the Windows 7 all those patches(?) I never had any on my computer. You know, if MS haven’t hijacked our desktop trays with their new Windows 10 icon back in late 2015, demanding we upload it, I would have continue the security updates since then. Stupid company. They should’ve stay with selling new OS on the shelves instead. >.< I can’t stand bullies which they did back in 2015. Oh. I do have one question though. The news kept saying Windows. They didn’t mention which one. Uh, all of them I think. Yep. Every %$#@! one of them. See my original article. That’s the claim I’ve seen from Microsoft, but I don’t have any independent corroboration. Has there been any evidence that Win10 systems not updated beyond January will actively deflect infection? If so, that’s important, and I defer to the experimenters…. Bottom line is that everyone should be patched up to date, regardless of Windows 10 being protected in this case by the original design of the current version of the WannaCrypt worm. There is no guarantee though that future attacks would not take advantage of this vulnerability and other vulnerabilities already made public. I remember reading that the tools released by the Shadow Brokers were all created before there was a Windows 10 and therefore didn’t work on it. But a far as I know this was no more than an assumption. That sounds like me. I think. It’s too bad I don’t get an email alerts whenever the MS-defcon is updated. I’m not on the PC alot so I just can’t keep coming to the website to see if it’s updated. @navi……….. why don’t you have some sort of reminder on your calendar for example to remind you to check what the Defcon levels are. Woody’s popularity has made it very difficult for him to spread himself any further than he does. His website is stretched financially and to put out an email reminder to everyone would be stretching it even further I feel. He really does more than he needs for us and it’s for us to keep abreast with all of this for ourselves. Yep. You can also use an RSS reader, or subscribe to @woodyleonhard on Twitter. Maintaining an email list is an enormous headache. As things stand, the web site just barely pays for itself. Adding a newsletter would tip the scales. The update shows on the installed list on the Control Panel, just doesn’t know exactly what or how it changes the OS… Let’s hope it changes for better! That’s what I’m looking into, as soon as my eyes open. Do you have any links? What is the infection vector? One of the confirmed infection vectors is the usage of the ETERNALBLUE exploit directly on machines which have SMB directly exposed to the internet. This chapter previously stated that we were in the process of verifying if phishing e-mails were also an infection vector for the WanaCry ransomware. Thus far Fox-IT has found no evidence that any phishing e-mails were related to this specific ransomware outbreak, and we have therefor removed the related indicators from this blog. An ArsTechnicadotcom poster asked whether the emergency MS17-010 patch will also be issued to unsupported/blocked Win 7/8.1 systems using Intel Kabylake and AMD Ryzen processors. The answer to this is: The MS17-010 patches have been around since March. No point in asking if they will be offered. Anything MS17- has been offered prior to April. … and I believe the instructions I gave are accurate. The problems with Kaby Lake, et. al., didn’t start until well after MS17-010 went out. That said, I wonder how Microsoft will handle similar alerts in the future? There has been a second wave of WannaCry/WannaCrypt. The first wave, detected on Friday, was blocked by registering and sinkholing a hard coded domain name which was found in the code. This created a kill switch to stop further infection. The second wave is a modified version of WannaCry/WannaCrypt which has no hard coded kill switch. This second wave was detected earlier today (Saturday). The WannaCry/WannaCrypt infection also installs DOUBLEPULSAR which will also have to be removed from an infected computer. Thanks so much for everything you are doing and thanks as well to your great helper experts. I couldn’t download for 8.1 64bit because I got a message that the site wasn’t working and the administrator of said site should be contacted. It seemed a bit weird because it was the link you posted (adjusted to the correct KB number for 8.1 instead of for win 7 as posted). It was odd though that a MS download site was not encrypted, ie not https. Well, it’s not the first time MS has been odd and dubious and other adjectives. P.S. Have you ever thought of writing a Dummies book for Linux? – because the way things are going with MS that’s my next OS and your previous books were good and helpful. Well, that is the reason behind why I suggested never to run WINE… if it allows running a Windows program, it might also be capable of running a Windows virus? Oh, all Windows, then? Thank you. Yes, except for the more recent Windows 10 builds which Woody mentioned. SMBv1 first came with Win 2000 and Win XP, which is vulnerable to the Eternalblue exploit. SMBv2 came with Win Vista. SMBv2.1 came with Win 7. SMBv3.0 came with Win 8/8.1. SMBv3.1 came with Win 10.
. . A company or home network over LAN/WAN may be running a gamut of interconnected Windows computers to facilitate file and printer sharing and other shared operations, eg from Win XP to Win 10 computers. So, for backwards-compatibility in networking, M$ included SMBv1 in all their later Windows OS versions that came after Win 2000/XP. Personally, as a Win 7 home-user with no important data stored on my system, I am not too bothered about this WannaCry ransomware or other malware because if infected, I can swiftly recover my system by just doing a clean reinstall or system reimage. But for those with important data stored on their computers, eg corporations like the NHS, they should be doing regular data or system image backups, in order to be able to recover from a ransomware infection asap and without having to pay the ransom. . . Of course, regular patching and running an AV program go without saying. “Given that 97% of phishing emails are ransomware and that 31% of the people who receive them open these emails (and often click on links/attachments), their chances for success are still quite high. The article includes a link to MS’s Baseline Analyzer 2.3, to discover which updates are missing. The tool also lists the missing updates by severity and potential impact. The NCSC are aware of a ransomware campaign relating to version 2 of the “WannaCry” malware affecting a wide range of organisations globally. NCSC are working with affected organisations and partners to investigate and coordinate the response in the UK. From investigations and analysis performed to date, we know that the malware encrypts files, provides the user with a prompt which includes; a ransom demand, a countdown timer and bitcoin wallet to pay the ransom into. The malware uses the vulnerability MS17-010 to propagate through a network using the SMBv1 protocol. This enables the malware to infect additional devices connected to the same network. If these steps are not possible, propagation can be prevented by shutting down vulnerable systems. Work done in the security research community has prevented a number of potential compromises. To benefit from this, a system must be able to resolve and connect to the domain below at the point of compromise. Unlike most malware infections, your IT department should not block this domain. Anti-virus vendors are increasingly becoming able to detect and remediate this malware, therefore updating antivirus products will provide additional protection (though this will not recover any data that has already been encrypted). The NCSC have previously published broader guidance on protecting your organisation from ransomware. criminals are now launching attacks using WannaCry 2.0 that do not have ‘kill-switch’ domain connect function. Yes, I have seen that same THN article published ‘everywhere’, but I haven’t seen anything to corroborate it. There has been so much other corroboration so far, that this seemed peculiar. It’s a disturbing, and very knowledgeable, report. I’m gonna grab a cup of coffee and see if I can find more credible evidence of WannaCrypt 2.0. Stay tuned. As we notified today, Microsoft took an unusual step to protect its customers with an unsupported version of Windows — including Windows XP, Vista, Windows 8, Server 2003 and 2008 — by releasing security patches that fix SMB flaw currently being exploited by the WannaCry ransomware. Are they saying Windows Server 2008 is unsupported? Windows Server 2008 is still supported until 2020, isn’t it? And although Windows Vista is now out of support, the update concerned, KB4015298, was released in March, when Vista was still supported. I believe Server 2008 R2 reaches end of support on Jan. 14, 2020. It can be patched with the Win7 patches. Server 2008 died long ago, if memory serves. That’s the one being patched in this TechNet article. Woody, I am talking about Windows Server 2008 specifically, not R2. It clearly shows that Windows Server 2008 SP2 has extended support until January 14, 2020. So it is definitely not dead yet, and not out of support. A Windows Server 2008 virtual machine that I have also can obtain patches up to this month. I have also downloaded a copy of KB4018271 (May IE9 Cumulative Security Update) for Windows Server 2008 x64 and attempted to install it on Windows Vista x64 before, and the installation was successful. By the way, the Vista patch I was talking about should be KB4012598. Sorry for the mistake. My hat’s off to you, Woody. I know how much effort it takes to create solid, accurate summary information such as what you have published here, and it’s right on point for those who really want to know whether they’re protected from these threats. The web needs more “this is how it really is” sites like this one. Hello! I have few question for you if that is fine with you. Today i need to go to patch my older win xp machines, they are mostly patched with SP3 but not fully patched with SP3 later updates. Would it be enough for the first fix just to install this new patch that Microsoft provided? This is also problem with w7 machines they are patched to some point, will it also be enough to install march update provided by microsoft for w7 machines? If the patches will install on the XP and Win7 machines they will fix the ONE vulnerability. But you are open to all the other vulnerabilities not fixed by all the other missing patches. Thank you for your answer! I will patch today only this update but will fix every other one during the week, since it is sunday. Do you maybe know is there any AIO security patches ISO for the Windows XP? You can TRY Windows Update. There MAY be patches up until the time MS stopped supporting XP (well passed the original EOL date). If you look elsewhere, you need to be REALLY SURE of the source you download from. I’m sure there are a LOT of bad sites offering updates filled with malware. Get rid (uninstall) old versions of java and flashplayer. Don’t use IE. Firefox ESL still supports XP. I believe that is correct. Kevin Beaumont twitted, … WannaCry as distributed doesn’t impact XP. This does not mean that WannaCry does not infect Win XP or that Win XP is invulnerable to the WannaCry ransomware. . . It may be that the ransomware-makers chose to not target Win XP computers because of its dwindling market share, similar to them seldom targeting Linux desktop computers. Instead, they targeted Win 7 computers first, because it still has a nearly 50% market share for Windows computers. . . Maybe, they will target Win 10, Win 8.1, Win XP, Win 8 and Win Vista computers later, ie down the line according to their market share. I don’t know, precisely, what this means. You may be able to bring XP “up to date”, this meaning XPLTSB (long term service branch) which MS made available to commercial customers, by following the recommendations here: http://www.pcworld.com/article/2310301/windows-xp-registry-hack-keeps-the-security-updates-rolling.html . It worked for me in January of this year and WU, in XP, still presents me with monthly updates for my XP contained in a virtual machine that I need for legacy programs. There will be a lot of updates, should this work, so be ready for that. Edit: If you choose to do this, and WU presents you with a list of updates, at least for the time being, hide the May .NET Framework updates, I encountered problems with these. You can always circle back, after everything else is updated, to see if you can get these to install. If you haven’t yet seen the Sunday updates at the top of the original blog post, please check them out and tell me if you’ve seen more up-to-date, reliable info. The exploit code used by WannaCrypt was designed to work only against unpatched Windows 7 and Windows Server 2008 (or earlier OS) systems, so Windows 10 PCs are not affected by this attack. Eternalblue is an SMB v1 exploit and it can be used by Win 10 for networking with other older Windows computers via LAN/WAN. M$’s Technet statement may only be referring to Win 10 not being vulnerable to email phishing attempts by the WannaCry ransomware since Win 10’s Windows Defender likely receives mandatory and immediate virus-definition updates. Regarding disabling SMB v1.0 protocol, MS article states procedures for disabling SMB server and SMB client, which one should be disabled for the desired effect? Or both? Also for lay users, is there a automated way to do it or settings menu it can be acessed through in Windows 7? Both parts (disabling SMB server and SMB client) should be done. If in doubt, you can ask at https://blogs.technet.microsoft.com/filecab/2016/09/16/stop-using-smb1/. to be totally exact, the March 2017 Previews of Monthly Quality Rollup for Windows 7 and 8.1 (KB4012218, KB4012219) also include the MS17-010 patch. I looked long and hard for the exact name of those patches – the name that would appear in the Installed Updates list – and couldn’t find them. Any idea? But I haven’t yet seen a definitive description of how the payload first gets into a network. Many believe that the first point of infection is via a rigged email — but I haven’t yet seen a copy of a bad email. A layperson query: Is the vendor saying that systems with exposed IP addresses (& lacking firewall protection ?) are vulnerable to WannaCry & similar attacks simply by being connected to the internet ? How does the payload enter the system ? Is it possible for an attacker to mass-scan IP addresses, check which IP addresses & ports are responsive, & then simply deploy the ransomware’s executable through an open port (eg. RDP port) ? Or is it possible to use steganography to hide a malicious executable within an image, & code it such that the payload would automatically extract itself from the image when the latter is viewed ? This can be a tiny 1 by 1 pixel white image embedded within an innocuous-looking webpage or email with a white background. So the “index patient” with a vulnerable OS on any network got infected via drive-by “shooting” through his or her open ports ? So far, HKCERT received two [WannaCrypt] incident reports. Both users were connected directly to the internet without using a router or firewall, and they had not installed the latest security update for their operating system. The govt was eventually caught red-handed by a university student who had a primitive firewall (or its precursor) on her home system. The govt’s excuse was that it was being “helpful” by scanning users’ systems to find out if they had malware or not. Who knows what else went on, besides the probing of vulnerable ports ? Deploying surveillance spyware perhaps ? Based on the excuse given, it sounds like the govt already managed to worm itself into home users’ systems. As I predicted, MS pushes Win10 as a solution to such attacks, but this is highly suspicious. My understanding was that the only way to be infected is by clicking on some email attachment. And indeed there are references in the media that the attack spread via human gullibility. Please follow the –Lounge Rules– no personal attacks, no swearing, and politics/religion are relegated to the Rants forum. Not entirely true. A computer on a local network can be infected within 2 minutes after another computer on the same network has been infected. Needless to say, the second computer did not open any email attachment. The worm tries to infect up to 100 computers at the same time via the SMB vulnerability. I’m the same “anonymous” from the above reply #115194. Just realized that there’s no way to submit a name & email address with the comment. The “Your Information” container is totally blank in my Firefox browser. A question regarding Server Message Block (SMB) … Seems that this WannaCry ransomware took advantage of an SMB v1.0 vulnerability. Despite seeing instructions from Microsoft on how to disable SMB on Win 7, this SMB feature doesn’t seem to exist on my Win 7 Home Premium system. There is no “SMB1” or any SMB-related values to disable (ie. set to “0”). Is SMB only present in Pro & Enterprise builds of Windows OS ? Get an account! All you need is an email address – and it’s MUCH easier to follow threads if the posters are identified, even if you give a bizarre name. Thanks, I’d created an account. I had posted comments (with name & email submission) at this website a a couple of times before, but I didn’t have to register first. And my comments at that time didn’t have to undergo moderation. 1) Interestingly, despite now newly posting from an account, all my comments so far went into moderation, before subsequently disappearing from the moderation queue without being published. I’d logged out & in, but my comments that were previously under moderation queue remaining missing. I guess this comment would be similarly affected as well. So I’m posting this using “anonymous” again to see if there’s a difference. 2) Not sure what’s up with the HTML removal issue as per my “anonymous” comment #115202. I always type out my comments on notepad, & then paste the text from notepad into the comment box. Even the registry key mentioned was obtained by right-clicking & copying my registry key, pasted into notepad before being transferred to the comment box here. So where might the (presumably-embedded) HTML codes have come from ? First time poster have to be moderated and moderation and things weren’t normal earlier. Your posts with your ID should be available now. Sorry about that. Is it necessary to update both kb4012216 and kb4012213 or just one of them on windows 8.1? You only need one of the March patches. Either one has the fix for the vulnerability. We have no idea what the effect on a pirated copy will be. That actually is an interesting point since there are a plethora of pirated copies of Windows out there. Imagine if the malware authors decided to now target only pirated copies of Windows. I blocked Port 139, 445, 3389, disabled SMB v1 on my computer (windows xp and 8.1) and fully update my antivirus definition but I didnt update my windows. Am I safe enough? Like it or not, Windows 10 IS NOT AFFECTED by this bug, patched or not. Then why did Microsoft release Windows 10 patches for this? Reports of Windows 10 not being affected are simply based on not seeing any Windows 10 infections. This should not be misconstrued to mean that the underlying vulnerability was fixed in all versions of Windows 10, since clearly it wasn’t. It merely means exactly what was stated — that no Windows 10 infections have been seen — and nothing more than that. One possibility is that the WannaCry authors might have deliberately avoided infecting Windows 10 due to its deep telemetry which could possibly be used to help to identify the malware authors. I am simply saying, don’t jump to conclusions in which 2 +2 do not actually add up to 10. That is delusional thinking which should be avoided. Then why did Microsoft release Windows 10 patches for this? Reports of Windows 10 not being affected are simply based on not seeing any Windows 10 infections. Not true, on both counts. Reports of Win10 not being affected are direct from Microsoft. What isn’t clear to me is if MS is talking about versions of Win10 that have not been updated since March. Thanks, that was the same Microsoft article I checked before posting my initial query. As mentioned, the issue is: There are no SMB1 or any other SMB-related DWORD values under that registry key on my Win 7 Home Premium system. I also compared my ‘Turn Windows Features On or Off’ pane against sample standard screenshots, such as this one or this one. The ‘Windows Features’ pane on my Win 7 does not have “SMB 1.0/ CIFS File Sharing Support” (shown highlighted in the aforementioned standard screenshots). As such, there is no SMB-related function I can untick there. Am I supposed to manually create the SMB1 DWORD value in the registry, & set this to 0 ? It seems counter-intuitive. It’s like … My door has no hole (or none that I can I find) — but I deliberately create a hole, & then patch that hole ? create a DWORD called SMB1 and set its value to zero. This will not create a hole. Instead, all it will do is make sure that your Windows 7 computer will not be able to use the SMB1 protocol. to which I received no reply. There may be others 1511 users who may be interested, so if anybody is knowledgeable, pls respond. Thanks. How to check if smb v.1 is enabled on servers prior to 2012R2? 2012 R2 status check is with this powershell command right? I have found an article that is warning about both SMB v.1 and SMB v.2? Is it not only SMB v. 1 that needs to be disabled if the system can´t get the patches installed now? And as far as I understand disabling SMB v.1 effectively protects against this threat? Is it not only SMB v. 1 that needs to be disabled if the system can´t get the patches installed now? My understanding is that disabling SMBv1 blocks WannaCrypt … but that’s just one of the possible problems. Best bet is to install MS17-010. I’ve seen conflicting reports about the exploit. Is it targeting SMBv1 or SMBv2? The vulnerability exploited by the EternalBlue tool lies in the SMBv1 implementation. However, to exploit it, the tool also uses SMBv2. This means that it uses both SMBv1 and SMBv2 packets during the attack. Disabling SMBv1 or SMBv2 prevents the infection; however, while disabling SMBv1 (an old protocol) has no significant impact on modern systems, disabling SMBv2 can cause problems. This is why it is highly recommended to disable SMBv1 for the current attack and for the future. Group A guinea pig. Win 7, 64 bit Home Premium., Downloaded every thing for May updates. so far nothing out of the normal. No slow down, no issues. Take that back. I do not download the Eastern European time zone and currency updates since I do not use them. Does nayone know, are external drives encrypted by ransomware, or only the local drives or “what Microsoft calls “Boot” drive, i.e drive C:\ ? What I am trying to find is if the File History drives are protected against ransomware. 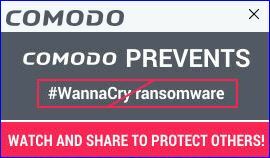 Be aware new ransomware variants will also encrypt or delete the backup versions of your files. This means that even if you have enabled File History, if you have set the backup location to be a network or local drive your backups might also be encrypted. Backups on a removable drive, or a drive that wasn’t connected when you were infected with the ransomware, might still work. In some cases, files may be recovered without backups. Files saved on the Desktop, My Documents, or on a removable drive are encrypted and their original copies are wiped. These are not recoverable. Files stored elsewhere on a computer are encrypted and their original copies are simply deleted. This means they could be recovered using an undelete tool. Benjamin Disraeli said: “I am prepared for the worst, but hope for the best.” What we seem to be doing, these past few days, and it is most certainly vital, is something in between these two points: We are discussing how to avoid the worst. Obviously, this is the best first line of defense and all that have contributed to this should be thanked profusely. But, we are not spending much time on the actual topic of “being prepared for the worst”. And whether it is WannaCry/WannaCrypt, or something else down the road, I think we should be spending some time on what to do if you get hit. So, this is going to be my topic, perhaps Woody will want to start a new thread for this topic. Back in November Woody posed the question: “What’s the best way to do a full image backup in Win7?” This discussion can be found here: https://www.askwoody.com/forums/topic/whats-the-best-way-to-do-a-full-image-backup-in-win7/ . Not surprisingly :), no consensus was reached, but a number of imaging programs were mentioned in this thread. Those new to this site, since November, should strongly consider going back to read this thread. After that, to whatever extent you are unfamiliar with imaging your primary hard drive, and this is probably most valuable to the home user, the pros on this site will likely have their own strategies, it is time to become familiar with imaging and then starting to do it. Because if you get hit, the best/easiest solution may be as simple as going back to a previous image (depending on how old the image is, some data will be lost unless you also are running constant backups of critical files). But even if imaging isn’t the “full” solution, and you have to do a clean re-install, after that, you can then go to your latest image and get back to pretty great point, before the infection, where all/most of your programs are present, all/most of you data is present, and most important, all of your Windows updates, to that point, are present. I am an attorney by profession, so I am not the person to tell you how to image, what program to use (I use Paragon Backup & Recovery), etc. That said, I do want to make one thing very clear to newbies to imaging: IT WILL NOT BE ENOUGH TO LEARN HOW TO IMAGE BY RUNNING YOUR IMAGING PROGRAM INSIDE OF WINDOWS FOR THE OBVIOUS REASON THAT, IF YOU GET HIT, AND ARE FROZEN BY SOMETHING, YOU CAN’T OPERATE IN WINDOWS. So, yes, by all means, start to learn how to image within Windows but make certain you have a CD/DVD/Thumb Drive, containing the imaging program, and your bios is set to boot to this device/media before launching Windows. If you don’t know how to do this, hire somebody to do it for you. And make certain you know how to image but, more important, make certain you know how to restore an image from your CD/DVD/Thumb Drive. Again, if you don’t know how to do this, or you can’t figure it out, then hire somebody to spend one or two hours to teach you how to do this. In summation: Now, more than ever, part of preparing for the worst must include knowing how to image and actually having images available for emergencies. Personally, I keep two available (on an external hard drive that is turned off unless I am using it), just in case one image is corrupted. Some may want more images, but two seems to be the minimum. As for scheduling, you must decide for yourself the correct frequency for your situation. But, please, if you don’t know how to create images of your primary hard drive, it’s time to learn, or be taught, a new skill. More than ever, PATCH RIGHT AWAY, and IMAGE RIGHT AWAY! You are so right about making frequent images. But if you wait a week or two after Patch Tuesday before installing the updates, you won’t be a Guinea Pig for everyone else if the patch has a problem. There isn’t just one risk here. It’s complicated, and requires a reasoned approach. This is only true if your OS and your data are in the same partition. Having separate partitions is a much better arrangement. 1. I tried installing the January security-only KB3212642 on both my and my mother’s laptops and both times was told it wasn’t applicable to the computer. Should I be worried? Is there an earlier patch (ie earlier than Oct 2016) that I need to install it? 1. The patch you mention is for Win7 SP1 – is that correct? 2. Did you download the correct bittedness – 32-bit of 64-bit? 3. Look in Control Panel\Windows Update. On the right click “View Update history.” If you find any of these updates (KB3212664, KB4012215, KB4015549 or KB4019264) you will not be able to install that update. 4. If you find KB4012215, KB4015549, or KB4019264 in the Update history, you are safe from the WannaCry/WannaCrypt exploit. 5. If you find NONE of the updates listed in #4 in the Update history, download KB4012212 from AKB2000003 and install it. Be sure it matches 32-bit or 64-bit of the PC. You can delete the install file after the reboot if it installs OK.
Hi there, yes, it’s for Win7 SP1, 64 bit. I used the link from that helpful German bloke’s monthly updates list. When I looked in the update history and searched my updates list, I didn’t have any of the four updates you listed. It looks like they’re all Monthly Quality Roll-Ups, and as a Group B’er, I’m trying to avoid those. Shall I bite the bullet and install the January Roll-Up (3212646) to ensure I get what was in 3212642? I have 4012204 and 4012212, so I think I’m safe, for now, from the WannaCry exploit. Shall I bite the bullet and install the January Roll-Up (3212646) to ensure I get what was in 3212642? With 4012212 installed you’re safe. There’s no need to install any rollups. it’s perfectly regular that you cannot install the January Security-Only Rollup with any of the March, April or May Security-Only Rollups present. They all include (supersede) KB3212642 without notification by the Microsoft Catalog. I have just recently made a suggestion to modify AKB2000003 correspondingly. Confusion is being created by referring to the security-only patches as “rollups”. Microsoft delivers the “Security Monthly Quality ROLLUP for Windows” through Windows Update to the PC. It contains both Security and non-security updates and is cumulative. Cumulative means that this month’s ROLLUP contains the previous month’s ROLLUPS. It is available to all Windows Users. An update starts being a rollup as soon as it’s made up of several inseparable units of maintenance. The Monthly Rollup is called a rollup for being made up of several updates. The Security-Only thing, for evidently being made up of several updates, cannot be considered anything else than a rollup. Your terminology may make sense internally, but it has no bearing on Microsoft’s terminology. The “Security Only Quality UPDATES for Windows” are NOT CUMULATIVE. To receive all security patches, you must install EVERY individual month’s security-only UPDATE. They are NOT offered through Windows Update. They have to be downloaded and manually installed. Only the “Security Monthly Quality ROLLUPS for Windows” offered through Windows Update are cumulative. Can everybody please stop using legacy unsupported operating systems. Please be grateful that you were thrown a lifeline for the next few weeks, but plan quickly for an upgrade, preferably to Windows 10 and keep updated according to the manufacturer’s instructions for your situation and not according to dubious guidelines, too easily found elsewhere. ch100 said please stop using legacy unsupported operating systems. The OP/Tinsel is using and querying about Win 7 SP1 x64. Is Win 7 a legacy unsupported OS? My information is correct. You cannot install KB3212642 with any of KB4012212, KBKB4015546 or KB4019263 installed. If you find any of these updates (KB3212664, KB4012215, KB4015549 or KB4019264) you will not be able to install that update. Why not? Even if KB3212642 has been superseded by any Monthly Rollup, then that’s an anomaly for a Security-Only something. 1. I know this version of anonymous is an attorney :). 2. I wanted to make this long for the new people and to stress the two most important things: a) Bios settings and b) the necessity to learn how to at least restore from CD/DVD/Thumb Drive. 3. One strategy, to split the baby between ann. and PK, would be to image just before running WU and then just after. If one does this, having a third image, older than a month would be advisable. 4. I know Woody has questioned the value of Group B, but I could argue this is now a new world in PC-land and if you image just before Patch Tuesday, and then manually install the two security updates (a. for your version of Windows and b. the IE update) you can then have some added security during the time the full group of patches are completely vetted. Worst case, there is something wrong with these two patches and you can immediately revert to pre-patch Tuesday status. Best case, Groups A & B have two of the three patches (not .NET Framework) already installed, and Group A can do their thing once Woody announces all clear on the full group of Patch Tuesday releases. The better question is not the viability of Group B, but the viability of Group W (BTW, seeing Arlo when he comes to town in October). Wish I could get there to see Arlo! You have presented a viable solution – but I have to make things very, very simple…. On my one desktop Win8 64 bit computer, I followed your link above for “Windows XP, Windows 8…under Further Resources at the bottom of the Technet page…” I choose the link to Window 8 x 64 and downloaded . I was given the default box of “open” and not “save”. And I got the message that it was installed, but I am not finding it in the Windows Update History. I tried again and got this message “Windows Update Standalone Installer Security Update for Windows (KB4012598) is already installed on this computer.” If I am not seeing it on my Windows Update History, is it really installed or must I do something else? Did you reboot the computer after the install? Boy, has it been hard to get into site today!!! Everybody freaking out. When I finished installing, I did not get a message instructing me to restart, BUT I chose to “Restart” my computer and not “Shut Down”. Then I checked the Update History and saw there was not anything showing for updates. That is when I click the link in the article for Win 8 x 64 and got the message that the KB article was already on the computer. Not being a computer techie, I am not sure where else to look to see if it is installed or if I need to perform another step in the process. Thank you. In Windows Update at the bottom left there is a link “View Installed Updates” Give it time to index. If you click on the column title for the name of the update it will sort it in alphabetical order. See if it’s listed there. This could be a “Moot” point while the current crisis is raging but as we speak different versions of this virus are emerging and the the Monday morning “Boot storm” is likely firing up in Asia/Austalasia/middle east and soon to be Europe. Does any one have any ideas as to what happens when you get the RSOD (Red Screen Of Death)? I am currently searching right now for details but they seem scant on the ground after all “fore warned is forearmed” for worst case scenario. Publicly shared Wi-Fi hotspots . . . maybe be certain your portable is fully patched before connecting to your coffee shop for a little surfing/email check. If you have installed the May Security Monthly Quality ROLLUP for Windows, you are OK. Since the Rollups are cumulative, the May Rollup contains the March Rollup. Woody, some of us out here in XP-SP3 land have tried to install KB4012598 (the WannaCrypt patch) on our machines only to discover that the patch rendered our USB ports non-functional. USB mouses (mice?) no longer worked and USB drives were no longer recognized. We had to use Restore to get system functionality back – or at least those of us who had another way of interacting with Windows without our USB mouses did. I am thinking that a bunch of others are now stuck not knowing how to proceed without a mouse. We need the patch, but we also need our USBs. Can you help us? I have left a message in the “Microsoft Community” about this. Got a dozen folks saying that they were having the same problems, but so far, no solution is being suggested. Information you might need to help us: I have XP-SP3 (32 bit) on an exceptionally dependable HP Pavilion notebook that I love. There is nothing special about the USB. It is 2.0 and only seems to be using universal USB drivers. The patch installed easily enough, with no errors generated. Upon first restart, it hung with a black screen, like it was in sleep mode, with no way to wake it up. I forced another restart and that’s when the mouse problem became obvious. I then checked Explorer to see if the USB drives were being recognized, and they were not, but there was USB power. Using Restore got my system back to the way it was with the exception of Firefox — that program couldn’t start and I had to re-install it to fix it. Never mind. I solved my own problem. Turns out that disconnecting from the internet, turning off all McAfee services (and every other program) and removing all USB accessories from their ports allows it to work properly. I disconnected the mouse right after I clicked on the agreement so that port would be empty as well. When it completed, the USB ports were all dead, but pressing ENTER re-booted the system without need for a mouse, and when the system re-booted, the USB drives were all functional again. @woody: the link to the patch for a localized Windows XP version at the bottom of Microsoft’s TechNet page you refer to, results in the update for Windows XP Embedded and not regular Windows XP (click on the link and then open Details: it says “Embedded” even though the title of the page says Windows XP SP3 and not Embedded). You may want to include a link to the Update Catalog in your article for those people who need the localized KB4012598. In Windows XP it is not possible to install a different language patch so falling back on the English version (which is correctly linked on the TechNet page) does not work. You should find all the patches for XP and Sever 2003 toward the bottom of the page Customer Guidance for WannaCrypt attacks: https://blogs.technet.microsoft.com/msrc/2017/05/12/customer-guidance-for-wannacrypt-attacks/ . The link to the patch for a localized Windows XP version at the bottom of Microsoft’s TechNet page you refer to, results in the update for Windows XP Embedded and not regular Windows XP (click on the link and then open Details: it says “Embedded” even though the title of the page says Windows XP SP3 and not Embedded). You may want to include a link to the Update Catalog in your article for those people who need the localized KB4012598. In Windows XP it is not possible to install a different language patch so falling back on the English version (which is correctly linked on the TechNet page) does not work. The problem you referred to apparently has been fixed by Microsoft. I had experienced the same problem before when attempting to download the Traditional Chinese version of the patch. But now that page does give the correct version instead of the Embedded version. Hi.. so i have win 10 creators update, is ut safe and already patched? So I don’t have to do anything? Windows 7 KB4019264 was updated to KB4019265 new patch on 16th May 2017. On Windows 7 all important and optional Windows Updates were downloaded until it was up to date, but it could not find any of the patches listed in View installed updates which was confusing. However instead of KB4019264 it had KB4019265 and a search found it on the Microsoft site listed as..
1) It says KB4019265 “includes improvements and fixes that were a part of Monthly Rollup KB4019264” however the Microsoft support page is not informative about exact patches included. Assuming because it says includes fixes from KB4019264 that it is patched for MS17-010 ransomware?. 2) It is listed as a non-security update but includes a critical patch for the MS17-010 ransomware. Assuming if users already have the KB4019264 patch then KB4019265 is just optional as it’s the same thing but with addition of a .dll file. And if users don’t have KB4019264 then Windows Updates either replaces KB4019264 or just jumps straight to downloading KB4019265?. As it’s new thought I’d add a heads up here, although I expect it will be detailed in due course. Thanks for the details Woody and hope this information helps others too. Windows 7 KB4019264 was updated to KB4019265 new patch on 16th May 2017. KB4019264 is the 2017-05 Security Monthly Quality Rollup for Win7. It is cumulative and contains three parts: security, non-security, and IE11 updates. It contains the patches from previous months’ Rollups. It is delivered through Windows Update as a CHECKED IMPORTANT update. KB4019265 is the 2017-05 Preview of Monthly Quality Rollup for Win7. It contains previous months’ Rollup plus the non-security patches that will become part of the June 2017 Rollup. It is delivered through Windows Update as an UNCHECKED OPTIONAL update. It is unchecked because it is not meant to be installed by the general User. It is there for IT people and other similar individuals to test before it is released as part of the following month’s Security Monthly Quality Rollup. The fix for MS17-010 was part of the March Monthly Rollup and has been a part of the Monthly Rollups since then. Hi @pkcano thanks for the reply, would you recommend it is okay to leave KB4019265 patch installed, or if it is test quality should it be uninstalled and install KB4019264 patch instead?. There is no problem leaving KB4019265 installed. The non-security patches for June that are included will be rolled into the June Rollup along with June’s security and IE11 patches. Just realize, if you install the Preview patches each month, you are helping vet next month’s non-security updates. Hi @pkcano thanks for the advice appreciated, I might leave it then. I didn’t realise the optional update was for testing, the title was “Update for Microsoft Windows” and with concern over recent ransomware it was included with important updates. I’ll check in more detail what optional updates are in future. Might see if there are snooping patches to remove. I read about monthly rollup bundling patches into one important update and you can’t see individual patches on Windows Update history only via the Control Panel, intentional I suppose forcing updates, but for those who want finer control it’s more time consuming, I understand that’s a different topic though. At least it’s patched against the ransomware that’s good. I used the XP patch on a genuine (XP sp3 English) install. It installed successfully and I assume I am now protected against Wannacry. Unfortunately it also seems I am protected against accessing my Kindle Paperwhite. I admit I have unlocked the latter and am running various non-standard apps, but it is the root file access that appears blocked. It will accept power from the USB port, but the computer does not see the device. The latest post seems to say that XP machines are not affected. That would appear to be correct (I think, I’m no expert) since some of the underlying Wannacry functionality does not (I think, I’m no expert) work on an XP install. Any comments or confirmation. During testing, SophosLabs found that XP wasn’t the effective conduit for infection via the EternalBlue SMB exploit that many thought it was, while Windows 7 was easily infected. The research showed that WannaCry ransomware can affect XP computers – but not via the SMB worm mechanism, which was the major propagation vector for WannaCry. Early in the outbreak, researchers determined that both SMBv1 and SMBv2 packets were used in the attack. Since both versions of SMB were in play, it could be theorized that Windows XP proved hard to infect because it does not include SMBv2, which was introduced in Windows Vista. But so far, it’s hard to reach that conclusion with 100% confidence. The bottom line: if you use older versions of Windows, you’re at greater risk for attacks like these. Windows XP isn’t as vulnerable to the WannaCry ransomware as many assumed, according to a new report from Kryptos research. The company’s researchers found that XP computers hit with the most common WannaCry attack tended to simply crash without successfully installing or spreading the ransomware. If true, the result would undercut much of the early reporting on Windows XP’s role in spreading the globe-spanning ransomware. The core of WannaCry is a vulnerability in a Windows file-sharing system called SMB, which allowed WannaCry to spread quickly across vulnerable systems with no user interaction. But when Kryptos researchers targeted an XP computer with the malware in a lab setting, they found that the computers either failed to install or exhibited a “blue screen of death,” requiring a hard reset. It’s still possible to manually install WannaCry on XP machines, but the program’s particular method of breaking through security simply isn’t effective against the older operating system. Was there a silver lining in WannaCry ransomware attack? “If there was a silver lining to wannacry, it’s that it [grabs] people’s attention” in regards to ransomware. What was once an obscure threat for a private individual, though an obsession for the security industry, is now a real and present danger in the minds of many more. Ransomware, it should be said is far from dead. In fact, it appears to be in rude health: There were 246 new families of ransomware in 2016, compared to just 29 in 2015. A recent PhishMe report revealed that 97 percent of all phishing emails contain crypto ransomware and another report from Infoblox recorded a 35-fold increase in ransomware domains in 2016. “Then I placed the systems live, deploying 7 Nodes into datacenters worldwide, opening up port 445 on the firewall for the first time, and made a brew while I waited for traffic to arrive. By the time I returned back to my desk with my brew, most of the honeypots were already owned, or blocking things.